This model was made for someone who has sent a request to my email a week ago. 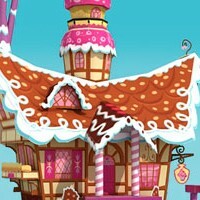 This building was a cake store in the Animated series My Little Pony: Friendship is Magic. As usual I did not immediately make the model on demand, but this time the requested object is very beautiful. Had long since I did not make a model of a building, so the process of making this pattern is a lot of fun. I am quite satisfied with the end result. The 3D Model is made with fairly easy, only takes about a day to make a simple model of this building. But the template coloring takes much longer. This model has 5 pages of pattern with bright colors, the same as to the cartoon version. There was many request from many Paper Replika friends, for me to make another Pony paper craft. So this is it, after quite a long time I created a template of Applejack. The shape I use for Applejack is the 3D shape of Fluttershy and modify her leg pose a bit. Also in Paper Replika page, there was a request to make pony’s hair to become more three dimensional. Applejack hair and tail already has a 3D shape. And there is another improvement, I managed to fit all the parts only in 2 pages. 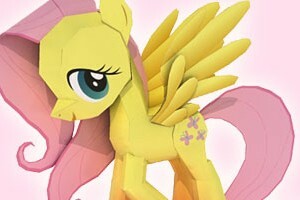 This is the second template of My Little Pony series papercraft kit, Fluttershy. In this template I made a few adjustment on its 3d model, so it is smoother then the Rainbow Dash. I also plan to replace Rainbow Dash with the new shape when I have time :D. There's a bit curvy on her hair, that you must bend it and will fall to right of her head. Please give me feedback with the new 3d shape and templates compare to the Rainbow Dash template. Which one do you prefer?, your inputs will be use to make the next ponies. This cute pony papercraft is a request from my friend Kevin. All the pony look adorable and I want to make papercraft series of them. Keep track of this series progress by following my Tweet : @paper_replika. 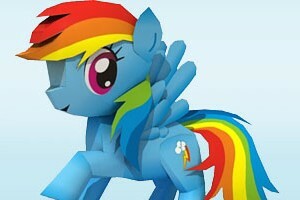 Rainbow Dash is a pegasus pony and one of the main characters of My Little Pony: Friendship is Magic. She is responsible for keeping the skies clear in Ponyville. She is also a huge admirer of The Wonderbolts and dreams of joining their flying group. She possesses the element of loyalty.